Hello there, Mozilla Firefox user. Pardon this interruption of your OkCupid experience. 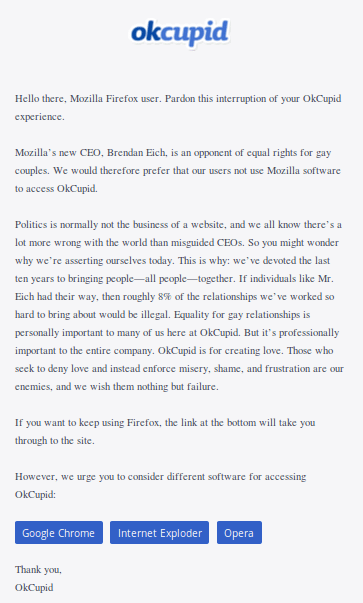 Mozilla’s new CEO, Brendan Eich, is an opponent of equal rights for gay couples. We would therefore prefer that our users not use Mozilla software to access OkCupid. Politics is normally not the business of a website, and we all know there’s a lot more wrong with the world than misguided CEOs. So you might wonder why we’re asserting ourselves today. This is why: we’ve devoted the last ten years to bringing people—all people—together. If individuals like Mr. Eich had their way, then roughly 8% of the relationships we’ve worked so hard to bring about would be illegal. Equality for gay relationships is personally important to many of us here at OkCupid. But it’s professionally important to the entire company. OkCupid is for creating love. Those who seek to deny love and instead enforce misery, shame, and frustration are our enemies, and we wish them nothing but failure. If you want to keep using Firefox, the link at the bottom will take you through to the site.